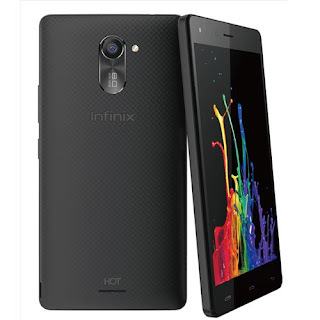 The Infinix Hot 4 Lite is a more affordable variant of the Infinix Hot 4. This mobile phone has almost the same specs as the Hot4 with the significant differences being that the Lite variant drops the fingerprint sensor and offers half the memory with only 1GB RAM. The Infinix Hot 4 Lite comes with the same design, display, and camera just like the variant Hot 4. This mobile phone comes in variety of colour; White, Black, Grey, Gold, Pink, Blue. The back covers are interchangeable allowing you to go with the best colour that suites you. Infinix Hot 4 Lite posesses 5.5-inch display with 720 x 1280 pixels on the front and 5 megapixels camera with flash for taking selfies. On the back, the Infinix Hot 4 Lite sports an 8 megapixels camera with LED flash. Infinix Hot 4 Lite runs Android 6.0 (Marshmallow) on a Mediatek MT6580 chipset with 1GB of RAM. The chipset offers a 1.3GHz quad-core processor. The phone has 16GB built-in storage and supports up to 32GB microSD memory card. This mobile device comes with a 4000 mAh battery with a promise of up to 18 hours talktime. According to Infinix, the battery can last an average user for up to 2 days. The phone also supports fast charging. Infinix Hot 4 Lite lacks a fingerprint sensor unlike the Infinix Hot S and the Hot4. It however supports Bluetooth 4.1 and two micro SIMs. Where to Buy Infinix Hot 4 Lite Infinix Hot 4 Lite in Nigeria. You can buy the Infinix Hot 4 Lite at leading online stores in Nigeria like Jumia. Infinix Hot 4 Lite Price in Nigeria ranges between 37,300 Naira and 45,000 Naira, depending on your location in the country. The Infinix Hot 4 Lite price in Kenya starts at 9,200 KSh.